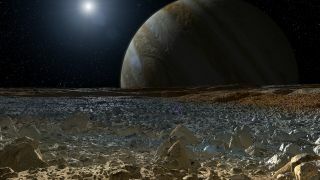 A simulated view from the surface of Europa, one of Jupiter's four Galilean moons. Saturn may have played a key role in the birth of Jupiter's largest moons, a new study finds. This discovery may shed light on whether potentially habitable giant moons could form around alien planets, researchers said in the study. Prior work suggested that Ganymede and Callisto likely harbor oceans of water underneath their icy crusts. Because life is found virtually everywhere there is water on Earth, this raises the possibility that these moons are potentially habitable, and has spurred scientists to speculate as to whether moons outside the solar system might harbor life. However, much is unknown about how giant moons form either in or beyond the solar system. Previous research suggested that the Galilean moons coalesced from a disk of matter that surrounded Jupiter during the last stages of the giant planet's formation. However, it remained uncertain where the building blocks of this disk came from and how they came to surround Jupiter, according to a new paper on the question. Specifically, prior work suggested that when Jupiter coalesced from the disk of gas and dust that surrounded the newborn sun, it opened up a gap in that protoplanetary disk. This gap should have largely isolated Jupiter from the rest of the protoplanetary disk, making it a challenge to explain how Jupiter has collected enough solid material to form its enormous Galilean moons. Now, researchers suggest that the Galilean moons may have formed with the help of Saturn. "Unveiling the critical role of Saturn in delivering the building blocks of the Galilean satellites was quite exciting," study lead author Thomas Ronnet, an astrophysicist at Aix Marseille University in France, told Space.com. The scientists developed computer models of the gap that Jupiter formed in the protoplanetary disk. They found that, at the gap's outer edge, a reservoir of planetesimals — the asteroid-size building blocks of planets — likely accumulated over time. They also discovered that Saturn's core may have either formed within this reservoir of planetesimals or migrated through it. Its gravitational pull would have scattered planetesimals toward Jupiter and the inner solar system, providing enough material to form the Galilean satellites in the orbits where they are now seen. In addition, the researchers found that Saturn's effects on this reservoir of planetesimals could have also seeded the main belt of asteroids between Mars and Jupiter with carbon-rich asteroids. Saturn may also have helped scatter ice into the inner solar system, helping to enrich them with water, the researchers said. "These findings stress how the presence of giant planets helps shape planetary systems and the distribution of minor bodies," Ronnet said. The findings suggest that giant moons may be more likely to form around planets within multiple-planet systems than in systems with single or isolated planets. "Satellite systems similar to those of the Galilean satellites may preferentially form around giant planets in multiple-planet systems," Ronnet said. If the Galilean satellites and carbon-rich asteroids in the main belt do have a common origin, future missions to Jupiter, such as the European Space Agency's JUICE (Jupiter Icy moons Explorer) spacecraft, could help test the idea that Saturn influenced the histories of both groups. Future research can also investigate why the Galilean moons have different compositions if they came from roughly the same reservoir of building blocks, Ronnet said. The scientists detailed their findings online April 9 in a study submitted to The Astrophysical Journal. Follow Charles Q. Choi on Twitter @cqchoi. Follow us @Spacedotcom, Facebook and Google+. Original article on Space.com.